Catch the Thief, If you can! Inspired by the classics like Atari’s Keystone Kapers, chase thieves around the town and THROUGH TIME! You choose between 8 playable characters, 2 in each game time, present, wild west, medieval and future. Crime is on the loose and you’re the only one who can stop it. Show no mercy to this vile thief that’s terrorizing the town, and chase him and his gang through different time eras. Use different weapons and tactics in different eras. Customize your character and find unexpected ways to fight crime. Tired of always playing the good guy? Well, look no further. It’s time to become the thief! In this game mode, you’ll have to come up with the craziest plans to escape the jail and get back to your life of crimes. I mean, look at all that money and jewels just sitting there, someone’s got to do something about this! Classic Split Screen action, gather your friends for frantic 4 Player fun! Initially, 4 Types of game mode, Battle (Cops vs Thieves), Catch the Money, Find the Exit, Deathmatch. Catch the Thief, If you can! launches January 19rd 2018! 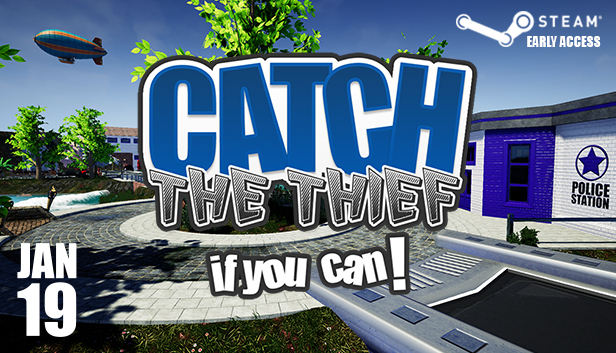 Today we're very excited to share with you that Catch the Thief, If you can! will launch on Steam Early Access January 19rd 2018! Don't forget to add us to your Steam Wishlist! Catch the thief, If you can! now on Steam. Catch the thief, If you can! now on Steam. CLICK HERE and go to our page!